Finding the perfect pair of hiking pants is tough. With thousands of pairs and variations on the market, finding a pair that is the perfect combination of comfort, functionality, and style can be quite the obstacle. A quality pair of hiking pants should be made from durable, lightweight material that allows for freedom of movement in various environments. Whether it be wet, windy weather or increasingly rugged terrain, a solid pair of hiking pants will keep you dry and protected from whatever elements your surroundings are made of without hindering your journey. The versatility of a pair of hiking pants is also extremely important to take into consideration before making the investment in a new pair. Many pants are convertible –either zipping or rolling up into capris or shorts. Of course, as with any pair of women’s wear, it would be a shame to not take style into consideration. 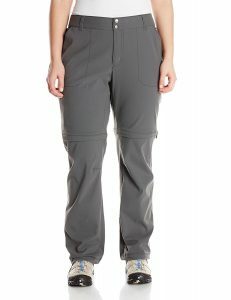 Many hiking pants are made unisex with functionality in mind and not fashion. Why not have both? In this guide we’ll explore our picks for the best women’s hiking pants on the market. Known for quality, the North Face does not disappoint with their Paramount convertible hiking pants. These three in one pants have zippers that allow them to transform into both shorts and capris making them literally the only pair of outdoor pants you’ll ever need. These hiking pants are made from an extremely durable nylon fabric making them virtually abrasion and tear-free. The material of the pants also features a DWR coating. This coating coupled with the hydrophic composition of the nylon material causes water to roll off the pants rather than absorbing into the material. This makes the pants extremely quick drying. In fact, these hiking pants have about a twenty minute-to-completely dry time when in the full sun. With an internal drawstring, these pants are sure to stay secure and in place when moving around allowing for greater mobility. The zippers on the pants hit both above and below the knee making them perfect for hiking, biking, and limited climbing as there’s no knee restrictions. One stand out feature of is the color coded zippers where the convertible parts of the pants detach. Red for the right side and blue for the left. This genius hack makes converting your pants to shorts, and back again, a cinch (or zip)! When it comes to comfort, it’s hard to beat Columbia’s Saturday Trail Stretch Hiking Pant. As noted in the name, these pants are equipped with a two way stretch making them extremely mobile. 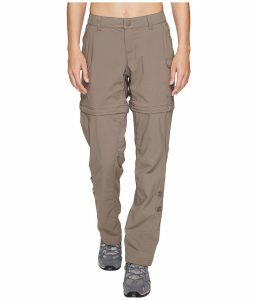 The material is laced with Omni Shade protection giving these pants great sun protection at a UPF of 50. Along with Omni-Shade, these pants also have Omni-Shield protection making them both water and stain resistant. 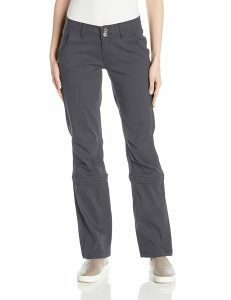 These women’s hiking pants feature a leg hem that cinches and rolls up allowing them to transition from a long pant to a shorter, lightweight capri pant. These pants also feature mesh lined pockets giving them some extra breathability and air flow. This combination is great for thistle heavy areas where you may want some extra leg protection without overheating. With a unique zip close security pocket, these pants would be the perfect fit for a causal day hike. The stylish slim fit allows for an easy transition from travel to trail. Designed with mobility in mind, Convertible Pant by Marmot Lobo are made from a blend of elastane and nylon. These materials are perfect for hiking, climbing, and jumping. The diamond shaped gusset was designed to keep your pants intact and split free no matter what. Typically, when one thinks comfort, they don’t think nylon. However, the people at Marmot took that into consideration when designing their convertible hiking pant and wove elastane throughout the fabric. This blend gives the pants a waterproof, flexible fabric perfect for your outdoor adventures. These multi-purpose pants convert into both 9 inch shorts and 24 inch capris and come in a variety of colors keeping you both covered and stylish. The convertible pant is also has a DWR coating and UPF 50 protection making them both water repellant and sun protected. These pants will be completely dry within 20 minutes in full sun. Couple this with the abrasion resistant nylon fabric and these hiking pants are a no-brainer. Comfort is essential when it comes to the perfect pair of hiking pants. These convertible pants are designed with a unique fleece lined waistband giving them and added level of comfortability around the waist and preventing chafing, especially when accompanied by wearing a hip belt. If you’re an avid outdoorswoman, Prana is a brand you’re no doubt familiar with. Ranking consistently at the top of charts, the brand’s women’s pant is one of the best pairs of hiking pants in the industry. Not only are these pants extremely functional, they’re also stylish. They are designed with a more tailored look making them extremely flattering on almost anyone. 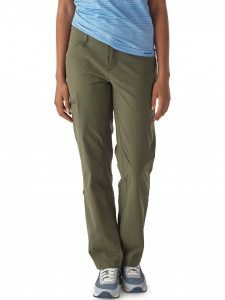 While most avid hikers prefer a convertible option, these pants do also come in a non-convertible option allowing them to appeal to each and every outdoorswoman. These hiking pants are made from the brand’s patented Zion Stretch fabric which is treated with DWR water repellant and wrinkle resistant. This special fabric is extremely breathable, light, and durable making them the perfect outdoor companion. 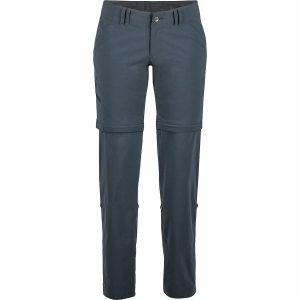 The relaxed fit of the pant is a crowd favorite and features a reinforced knee making these hiking pants perfect for climbing, hiking, and mountaineering. In fact, they were our top pick in terms of mobility. A huge bonus comes with the addition of a hidden zippered stash pocket located on the upper right leg. When looking for a quality pair of hiking pants, it’s important to take the weight of the material into consideration. The Quandary Pant from Patagonia is extremely lightweight making them easy to be mobile in and light enough to wear all summer long. These pants are definitely made with women in mind. At times it can be difficult to find pants that perfectly fits both your thighs and booty, these pants solve both issues with a fit that makes them very comfortable in both the waist and legs. The waistband of the pants has belt loops and a hidden drawcord insuring the pants stay in place no matter what activity you are partaking in. An inseam gusset adds both stability and mobility to the pants making them perfect for both hiking and climbing. Built with partially recycled material, these pants are not only multifunctional, but also good for the environment. The material is also DWR coated making them water repellant and include UPF 50+ sun protection. Special features of these hiking pants include two front drop-in pockets, two back pockets—one drop-in and one with a reverse coil zipper closure and a security cargo pocket on the right thigh that completely zips. While shorts aren’t an option, these pants do convert into capris with a loop and metal snap to keep the cuffed fabric in place. One of the most important features of hiking pants is the material they are made out of. Beyond the obvious qualities like breathability, the pants also need to be able to withstand the sharp rocks and other snagging objects one encounters when hiking. Typically, the best abrasion free pants are made from some type of nylon blend. The trick is to find pants with enough nylon to make them tear resistant, but also enough of the secondary material to make the pants comfortable for all day wear. Much like the in the sun, our legs tend to be an afterthought when protecting our body from the rain or water. As important as a rain jacket is, so are water resistant hiking pants. Having to trudge through the remainder of your hike with cold, heavy, wet pants is miserable. Look for pants made from quick drying materials or with special DWR (durable water repellent) coating on the fabric to ensure you stay dry and comfortable for the majority of your journey. 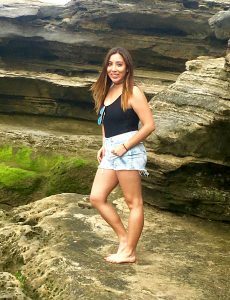 When you’re out on the trails, especially when hiking, you’re typically wearing pants and virtually no other barrier between your legs and nature’s elements. Because of this, most people don’t think of protecting their legs from the sun’s damaging rays. It’s important when shopping for hiking pants you taken the UPF (or sun proof) rating into consideration. Many pants have special fabric to create a barrier between the sun’s rays and your vulnerable skin. Spending time outdoors, especially when hiking, is notoriously hard on your hiking gear. This is why, when shopping for gear you want to make sure you have the best option for your needs. With the price of hiking gear consistently increasing year over year, it’s important to choose options that are going to last wear after wear. Hiking pants are no exception. Hiking pants should be made from material that is going to resist abrasions when rubbing up against sharp rocks. Beyond the material, you’ll also want to pay attention to the construction of the pant. 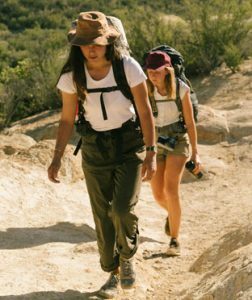 Many hiking pants will have reinforced knees or gussets to add extra structure and stability to the pant. This reinforcement allows the pants to hold up trip after trip no matter how active you plan on being. Choosing the perfect pair of hiking pants is hard. We’re here to help make the process a little easier for you. 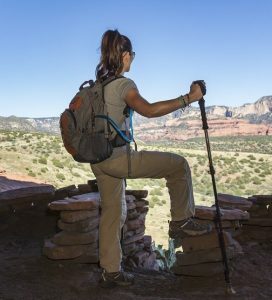 We took several things into consideration when ranking our top picks for the best women’s hiking pant including the pants’ stylishness, comfort, and the ability to resist both weather elements and abrasions. When it comes to quality, you can’t beat The North Face’s Paramount hiking pants. These pants are the perfect combination of both comfort and functionality, allowing them to cinch the top spot on our list. These pants convert into both capris and shorts making them the only pair of outdoor pants you’ll need. While the other pants on our list didn’t secure that top spot, you really can’t go wrong with any of the hiking pants in this guide. Each pair has UPF 50 sun protection protecting your vulnerable legs and DWR coating making them water repellent. With each of their own unique qualities, this list ensures you’ll find your perfect fit.